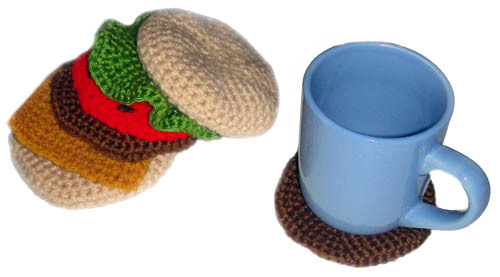 This crocheted hamburger isn’t just fun to look at, you can use every single piece of the burger as a coaster! One hamburger contains 7 coasters, but of course you can add extra cheese or other ingredients to make your burger even bigger. This pattern set can be downloaded in the Crochet Spot Store. Download without charge if you are a Premium Pattern Member. By purchasing this pattern, you’re helping to support Crochet Spot in creating more tutorials and patterns that you enjoy on this site. Thanks in advance for visiting the Crochet Spot Store and for all of your support! 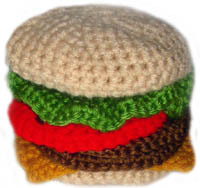 This entry was posted on Sunday, August 16th, 2009 at 12:00 AM by Rachel Choi	and is filed under Best Crochet Patterns. You can follow any responses to this entry through the RSS 2.0 feed. You can leave a response, or trackback from your own site. Oh that’s so awesome! I can’t wait to download it! I really enjoy your patterns because they are so different. I am no longer able to get any of your patterns because I am unemployed and cannot afford to BUY downloads from your store. It was so nice to follow your progress and get your patterns but I can no longer follow your blog or BUY your downloads. What an incredibly ADORABLE pattern! You are so creative girl! This is so, so awesome! One of the most creative patterns I’ve ever seen. Thank you! I’m a Premium Pattern Member! For me it’s a no brainer that paying only $10 a month for ALL THE PATTERNS in the entire store is a steal. I mean, I pay more money for coffee every month, and I know that my $10 is going to a good person who works so hard to make these great patterns! Thanks Rachel for making your patterns affordable through your membership option. Even people like me who are on a tight budget can afford it. Rachel, this pattern is so cleaver. The detail in each piece looks so authentic. I so look forward to each and every news letter you send out. I don’t think I have ever known someone as cleaver and creative as you. Keep it up girl. You make my day!!!! This is not her idea, I had a friend send me this pattern from a crochet book that was at least 30 years old, I believe it was Crochet world. I have made dozens of them, but have lost my directions and was hoping to find it free on the net. But I guess I’m out of luck. Hope my friend still has the book. I’ve been searching for this pattern for years! I can’t wait to get started on it!